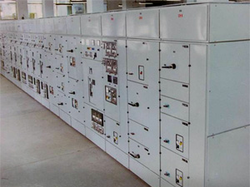 Elecmech - Manufacturer of fully draw out and non-draw out motor control centers, power control centers & power control centres lt switchboard upto 6000 amps since 1962 in Mumbai, Maharashtra. Maintenance features: Elecmech d/o mcc panels are designed to be maintenance free, telescopic, ails & racking screw, positive guidance by proven rack and screw arrangement, smooth movement, of the module, perfect alignment of contacts, no banging of bus bars on insertion of modules, eliminates the need to remove the module for routine checks / minor modifications, all identical drawout units are fully interchangeable thus minimizing downtime, vertical t droppers minimizes the number of joints thus reducing heat losses and the number of joints to maintained, tin-copper electroplated aluminum t section vertical bus ensures that there is no direct copper to aluminum contact, ensuring no corrosion due to cu to al joint t electroplating of the t dropper eliminates additional cop-al joint. Draw out feeder door: indicating lamps, push buttons, meters and selector switches are mounted on draw out feeder’s door, this door can be hinged out for inspection / maintenance of the connections., only the d/o FDR door needs to be changed in case of change in specified control equipment. 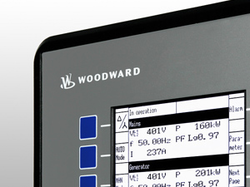 Design features: Fully draw out module with 3 service, test & isolated positions, Service: power & control contacts engaged. In conventional bus bar system, conductors of each phase are grouped together. At higher current ratings in each phase, more than one flat of bus bars placed quite close to each other are used. Skin effect & Proximity effect, causes uneven current distribution in each flat of the same phase which also results in unequal temperature rise in different phases. At higher currents increase in cross-sectional area of conductors does not yield proportionate increase in the current carrying capacity of the bus bars. The interleaved bus bar system offers a cost effective solution. Cable Termination is at the rear of the panel. Elecmech Standard PCC / PMCC panel dimensions are more than sufficient, However Panels can be custom designed for adequate space for termination of increased number aluminium cables for special cases such as for Material Handling Applications Stacker Reclaimer, etc. Wide cable alley facilitates comfortable termination of a large number of cables. Shrouded link work for multi-tier configurations ensures complete safety in the cable alley. 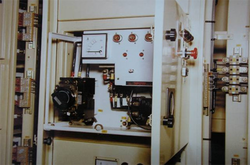 Standard panels are provided with captive screws / Quarter turn knobs. However customized Panels can be provided with Alphabetical Key lockable doors to prevent un-authorized access to the cable alley. Control Cables Terminals are provided vertically at the rear side panel on the left. So there is ample space for control cabling. Add on chamber: The cabling area can be extended further by providing an ADD ON CHAMBER to accommodate more cables if needed. For ease of Maintenance and trouble free operation, Elecmech offers standard Single Tier ACB panels upto minimum 550 width, However Multitier designs are also offered for switchgear rooms with space limitations and for cost effectiveness. Standard Single Tier: for ACBs 630 to 6300A. Multi-Tier Arrangement: 2 tier arrangement for ACBs upto 1600A. PMCC: 8 feeders (fuse switches) in a panel. Compartment sizes can be 225 to 900 mm. Auxiliary Equipment Mounted by the side of ACB. Separate Chambers for Busbars, Droppers Auxiliary Busbars. Panels can be offered confirming to Form 2 / 3 / 4. 63 Amp. And 16 Amp. Plug - Socket Unit with M.C.B. Weather Proof 16A Plug Socket Unit with Switch or M.C.B. By: Veracious Electro-fab Pvt. Ltd.